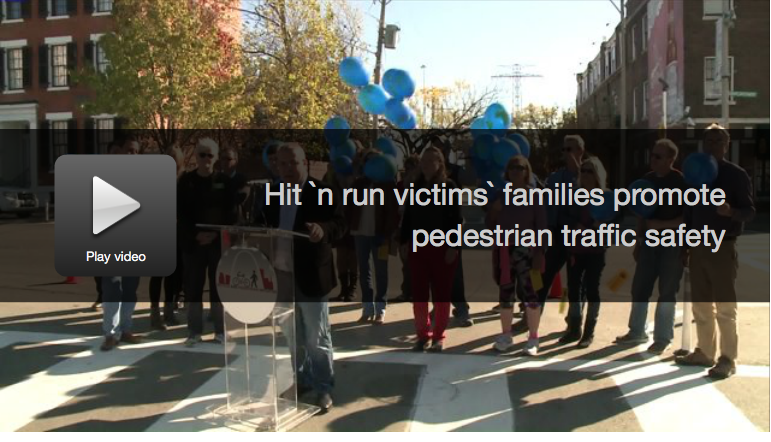 ST. LOUIS, MO (KTVI) – Balloons were released into the sky at a south city intersection Sunday as friends and family of two people struck and killed by cars gathered at the intersection of Cerre Street and South Broadway to discuss pedestrian traffic safety. Amber Wood and Bapi Gupta were both killed while crossing the street nearby. Wood’s mother, Georgie Busch, said she will do everything she can to make changes and save others. Wood, 27, was killed in 2012 by a hit and run driver on South Broadway. Gupta, 50, was hit by a speeding Mercedes as he left the Broadway Oyster Bar. He died a week after the accident. Two teenagers were eventually arrested and charged in the case. The installation of two new flashing street signs is also part of a worldwide day of remembrance for millions of people affected by pedestrian accidents. The six-month-old Bicycle and Pedestrian Initiative (BAPI) is designed to bring attention to safety on the streets of St. Louis. The flashing signs are the first of their kind in the city.